Just after multiple witness traveled to the Hague to testify against the White Helmets, explaining the the Douma chemical attack was staged and never happened, the US has reportedly frozen their funding. The White Helmets, a Nobel Peace Prize-nominated organization that has been painted as a selfless “humanitarian group” by the media, but caught multiple times aiding terrorists, has just reportedly had their funds frozen by the United States. The move comes just after witnesses of the alleged chemical attack in Douma told reporters at The Hague that the White Helmets video used as a pretext for a US-led strike on Syria was, in fact, staged. On Thursday, CBS reported that the State Department has put the group’s support “under active review.” Prior to freezing the funds, the US has provided approximately one-third of the groups overall funding. This move serves as a significant blow to the alleged humanitarian group. This green light never came. The timing of the funds freeze is important to note as it comes amid major controversy after witnesses in Douma have allegedly caught the White Helmets in a lie—selling a fake attack to trick the US into striking their enemies in Syria. As TFTP reported last month, witnesses have come forward and described how they were given free food to participate in the filming of a fake attack. 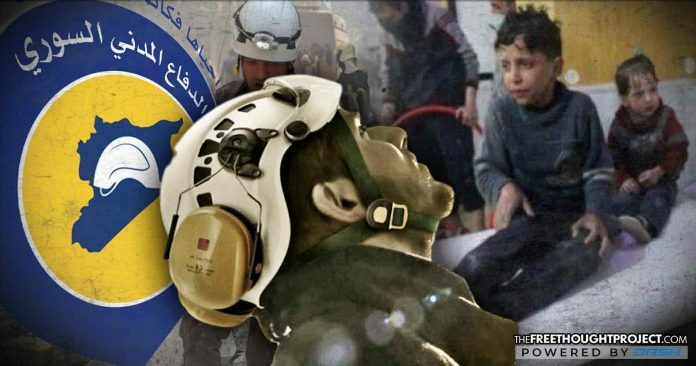 After this report, witnesses were flown to the Hague to testify against the White Helmets at the Organization for the Prohibition of Chemical Weapons (OPCW). In a press conference following the hearing, hospital staff and one of the children who claims to have been given free food to participate in a staged video said there was never an attack. The video was the only publicly available “evidence” cited by the West which they used to justify launching a coordinated attack on Syria by the UK, France, and the United States. If the report from CBS is true, and the US actually froze funding to the White Helmets, this could indicate a significant move from inside Washington to halt funds flowing to terrorists and their supporters. Although the White Helmets and their supporters claim the group is responsible for saving 70,000 lives, to those paying attention to Syria, the truth appears to be quite the opposite. A Twitter post from last year by user ‘Walid’ appears to show the famed White Helmets taking care of injured Al-Qaeda fighters who were recently wounded on the Syrian battlefront. This is just one of many in a series of videos, which has served as evidence that the White Helmets are not what they appear. While helping injured people, regardless of what ‘side’ they are fighting for is noble, it is important to point out that the white helmets reportedly never help those injured by ISIS. Countless Syrian citizens have come forward to expose the group’s utter lack of care for injured men, women, and children alike — while helping only those who are friendly to the resistance. The group also came under fire in June of 2017 when video surfaced that showed members of the White Helmets assisting in disposing of the dead bodies of Syrian soldiers. The US-backed “aid workers” were seen celebrating their kill whilst holding the heads of the dead. As it stands, the White Helmets are also funded by the U.K., as well as many other international entities. That may be the reason they always worked in rebel-held areas of the greater Syrian conflict. The White Helmets serve as a de facto propaganda wing of the West to sway public opinion into supporting regime change in Syria. As proof, one only has to look to the story of Omran Daqneesh, a Syrian boy reportedly pulled from the rubble of a bombed out building. Just like Dair, Daqneesh’s image was broadcast around the world and used as a propaganda tool against Syrian President Bashar Al Assad. When they are not being caught on camera participating in terrorism, the White Helmets are allegedly recruiting support from Hollywood using funding from Saudi Arabia. Last month, the Free Thought Project reported that Pink Floyd frontman Roger Waters stopped a concert in Barcelona to warn the crowd about pro-war propaganda that is coming from a group in Syria known as the White Helmets. After that, Waters published emails showing how the group was attempting to recruit him for PR purposes.